The NSW Women’s and Men’s Amateur Championships are underway this week at Terrey Hills Country Club and Mona Vale Golf Club on Sydney’s Northern Beaches. The NSW Medal is played over two courses. It is two rounds of 18-holes stroke play, played over two days. The field is evenly divided between the two venues for the first day with players changing venues for their second round. The winner of the 36 holes stroke play section of the Championship is the winner of the NSW Medal and the top-32 men qualifiers proceed to the match play championship. The leading 16 women players from the Stroke Play Championship will be eligible to compete in the NSW Amateur Championship Match Play with both the men’s and women’s titles being contested over a 36 hole final at Terrey Hills Country Club on Friday. The Men’s championship has produced a strong mixture of Australian and international players doing battle. Local Nathan Barbieri will be looking to go one better than his runner up finish last week at the Australian Amateur where he was pipped on the first playoff hole by Irishman Connor Purcell. Barbieri is one of a number of marquee NSW player in the lineup that includes, to name a few, Jordan Garner, Blake Windred, Harrison Crowe, Jye Pickin and Josh Armstrong. There are also a number of English internationals competing including Benjamin Jones, Jack Hawksby and Bailey Gill. 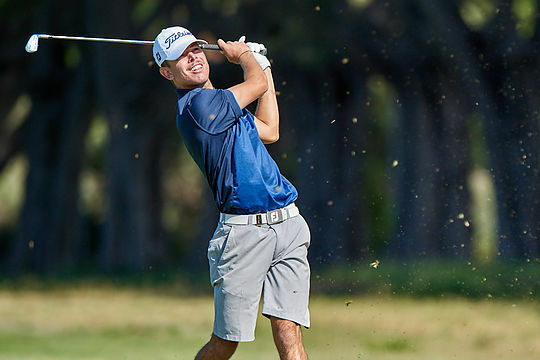 Keep an eye out also for Canada’s Joey Savoie who scored an albatross on the West Course at Royal Melbourne during the recent Australian Master of the Amateurs before securing a top-6th finish. Savoie is Canada’s top-ranked amateur and made the quarter finals last year in this event and has claimed a number of titles including the 2017 Tailhade Cup, 2018 Tennessee State Open and was co-medallist at the 2018 US Amateur qualifying. In the women’s championship Doey Choi, Grace Kim, and Stephanie Kyriacou – a winner two weeks ago at the Australian Master of the Amateurs at Royal Melbourne – head up the Aussie contingent along with Kelsey Bennett. A strong international presence sees players from South Korea, England, Japan, France and New Zealand in the field. These championships tend to deliver a international feel with many of the past winners being internationals. England has dominated the men’s title for the last few years and South Korea has been successful in the women’s championship. Last year England’s Gian-Marco Petrozzi and Korea’s Ina Yoon won in a thrilling final day at Royal Canberra Golf Club against Aussies Jed Morgan and Doey Choi. In 2017 at Terrey Hills Country Club, England’s Scott Gregory defeated fellow countryman, Marco Penge, 1-up, and in the women’s final Somi Lee secured the title in a tight match against her Korean counterpart Hye Jin Choi, 2&1.